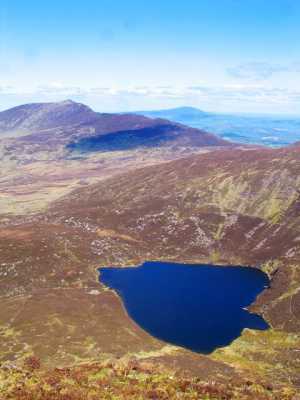 Coumfea North Top is the 91st highest place in Ireland. From the Nire Valley car park(S 277 128 A), room for 20 cars but note this fills up fast on weekends, walk back down the road towards Ballymacarbery for about 500 meters. You'll come to a gate on your left with a muddy track leading down the slope towards the river. Cross the river over a makeshift bridge and follow the rising track towards the mountains. After passing a ruined farmhouse the track leads through a galvanised gate and out across the bog. The track goes much further than shown on the map and although in places it is indistinct, you can follow it all the way to approximately S28313 11290 B with little difficulty. Cross white gravel and peat hags to the featureless summit of Coumfea. One of the joys of hill walking and mountaineering in Ireland is being able to escape from the hectic life of the city to savour the solitude of the rural landscape either on your own or with some companions. But this is not always possible. On several of our walks in Britain we have experienced an almost continuous procession of persons up the mountain (for example the queue on Sharp Edge/Blencathra or Scafell). Whilst we should all applaud those who take exercise and enjoyment from the countryside the sheer numbers of persons on a particular route can cause problems, especially in the form of erosion of the soil and damage to flora and fauna. Fortunately this is less of a problem in Ireland (where there are less walkers and few signed routes), but there are exceptions such as the damage caused by walkers on popular routes such as the Devil's Ladder, Great Sugarloaf and Slieve Donard. In the case of the later (Slieve Donard) a bed of stone has been laid along many parts of the path in order to reduce erosion - but this is hard on the feet and legs and many people are now making new routes to the side of the 'path', causing new areas of erosion. One solution to erosion problem is to 'spread' the load of walkers by taking alternatives to the popular routes or better still making your own new route. Making a new route in Ireland should of course respect the landscape and the landowners (from whom permission should be sought). Kernowclimber and I have a particular passion for finding a less well trodden (and somewhat harder) route up the mountains by way of scrambles either in gullies or along ridges. 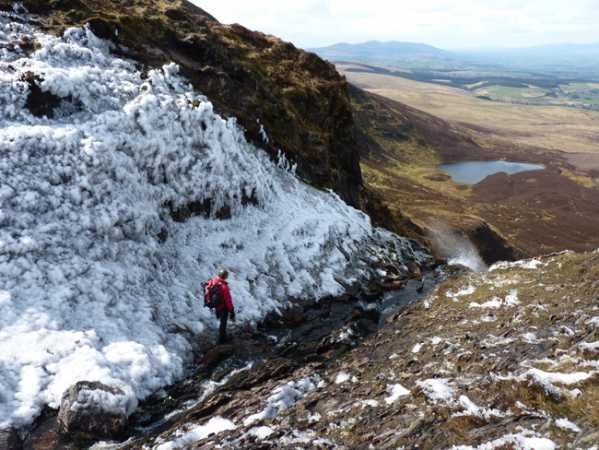 Barry Keane in the late 1990's published a number of books on 'New Irish Walks and Scrambles' and one of his scrambles is up Sgilloge Gully below Coumfea North Top. To reach Sgilloge Gully, park at the Gap Car Park and walk eastwards towards the direction of the Gap but then veer SE once in the open countryside towards the Sgilloge lakes. 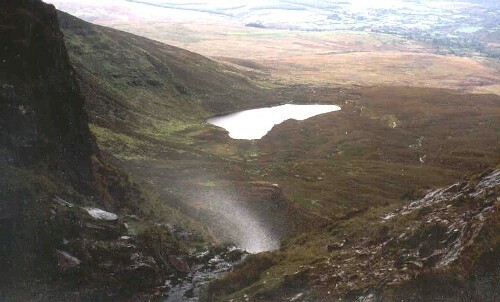 The corrie behind the eastern lake has a number of gullies (including the prominent stream on the left which falls off the Coumfea plateau). We took the gully which is immediately south of the lake at S296113 D and which has a large talus slope at its base. The gully is damp and mostly vegetated with occasional rock steps. It splits roughly halfway up and the right split is probably the most challenging. 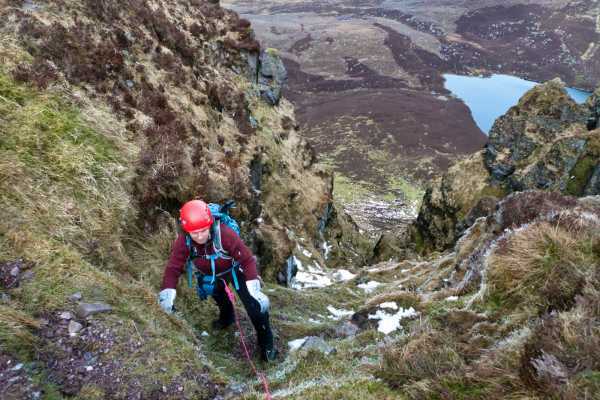 However the gully rarely exceeds a grade 1 scramble and a rope is probably only necessary for those who need extra security or in winter when icy (although a helmet should always be worn). When we did the gully the turf was frozen and it may be a bit harder when it is wet and slippery. Picture from kernowclimber : Mcrtchly looking for the old lady! Picture: Mcrtchly looking for the old lady!